The story of Christ Covenant is dynamic and on-going, serving as a testimony of God's faithfulness and His providence. In 1974 the Calvary Presbytery of South Carolina planted a mission work in southeast Charlotte: Alexander Presbyterian Church. Fulfillment of that task was hindered by a number of obstacles, but the cause was right and, in God's time, the seed sprouted, first in the hearts of four families, then in the hearts of many more who embraced the vision. Around this small core of faithful families, God raised up a renewed work in 1981 led by Reverend Bob Wilcox, the Central Carolina Presbytery Evangelist. Taking the name Christ Covenant, the church became an organized congregation (a congregation with elders) of the Presbyterian Church in America December 5,1981. By 1983, Christ Covenant was a sturdy seedling of 38 members meeting in a modular building on Alexander Road. A search for its first full-time pastor convinced Rev. Harry L. Reeder III to return to his native city from an effective pastorate in the Miami, Florida area to become Christ Covenant’s senior pastor. Having a gifted pastor and the support of Briarwood Presbyterian Church in Birmingham, Alabama as a mother church, Christ Covenant began to grow rapidly and moved its services from its modular unit to Charlotte Christian School while it searched for the right tract of land and developed its building plans. The congregation purchased land in Matthews that forms the core of our 69-acre campus, including a 28-acre athletic field complex. Christ Covenant Church is located in Matthews, North Carolina. The worship center forms the core of our 69-acre campus, including a 28-acre athletic field complex, Warner Park. The campus includes eleven buildings with a sanctuary that seats 2,000. One of our newest buildings is a Community Life Center, including a level for youth with a large meeting space and break-out rooms, a large fellowship hall with a commercial kitchen, and a chapel where more intimate services can be held. We have recently completed a new high school building for our Covenant Day School community, which gives the school much-needed space to grow as well as access to new technology. Christ Covenant has a current membership of more than 750 families. The congregation is assisted in its ministry by a staff of over 60, including pastors and directors, and supports church planting efforts not only in the Charlotte region, but all over the U.S. and around the world. Among the church's associated ministries are Campus Outreach and Covenant Day School with an enrollment of more than 840 students in grades TK-12. Christ Covenant is a member of the Presbyterian Church in America. 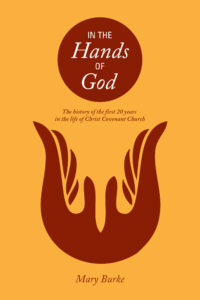 Written by our church historian, Mary Burke, this book documents the history of the first 20 years in the life of Christ Covenant Church.